Seagate brings over 20 years of trusted performance and reliability to the Seagate ® BarraCuda ® 2.5-inch HDDs - now available in capacities up to 5 TB. 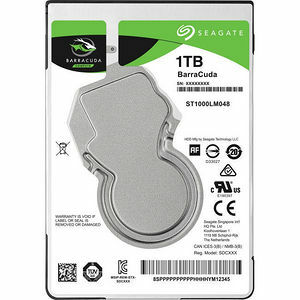 Broadest 2.5-inch hard drive portfolio with up to 5 TB capacity and both 7 mm and 15 mm form factors suitable for a variety of compute applications. Thinnest and lightest 2.5-inch hard drive with up to 2 TB storage in a 7 mm z-height, providing seamless upgrades of thin and light laptops and smaller form factor systems. Fast data rates of up to 140 MB/s enables superior PC end-user experience and snappier file transfers. 2.5-inch, 15 mm z-height hard drives provide 3 TB to 5 TB in capacity, offering the highest-capacity 2.5-inch hard drives available for external or all-in-one storage. 15 mm z-height enables slimmer all-in-one desktop PC drives while helping reduce system heat generation and vibration. Low startup current configurations for 3 TB to 5 TB drives enable use in legacy low-current systems like USB-2 external boxes, while simultaneously lowering power consumption. 5 TB drives can store more than 1.25 million songs and 600 hours of HD video.